Ok friends! It's story time. My grandma turned 86 last Wednesday. When searching for a gift, I knew I wanted to get her something special. there it was in the corner of my eye. I'm just going to lay down some groundwork here; my grandma is a pretty serious reader, let me tell you people. Haha. I knew she would read it. She didn't know, but I knew... that it would be sitting there staring her in the eyes after her television programs are over...and that once her eyes hit the page, there would be no going back. Because you cannot stop yourself from reading this book once you've started. Seriously, I dare you. and the two 00 of 2009 are the lenses. Oh and we got her a card that sang "What a Wonderful World" when opened. 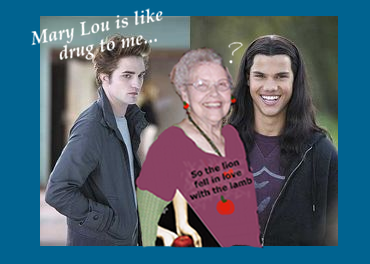 So today I get home and Julia (sister) informs me that there has been some Twilight activity in the life of Mary Lou Duke. I smile instantly, knowing that my prediction came true. Haha. Jules told me (get this) that my grandma had confessed to her that she had planned on skimming through the book and telling us that she read it and liked it. This was a premeditated fib, people. She never made it to Half Priced Books. in just one sitting and could not wait to get home and read it. Grandma Duke has turned Twilight. Only one question left: Team Edward or Jacob?